As more and more internet traffic goes mobile, consumers search, transact, and experience the web in new ways every day. The Mobile Websites for Local Businesses webcast will highlight these shifts and help small businesses in almost any space reach their customers more effectively. We will discuss the explosive growth in mobile internet usage, trends and facts about mobile web browsing, mobile web best practices, and why small businesses need mobile-optimized version of their websites. We'll discuss recommended methods for easily 'mobilizing' a website and key features such as click to call and social media integration. 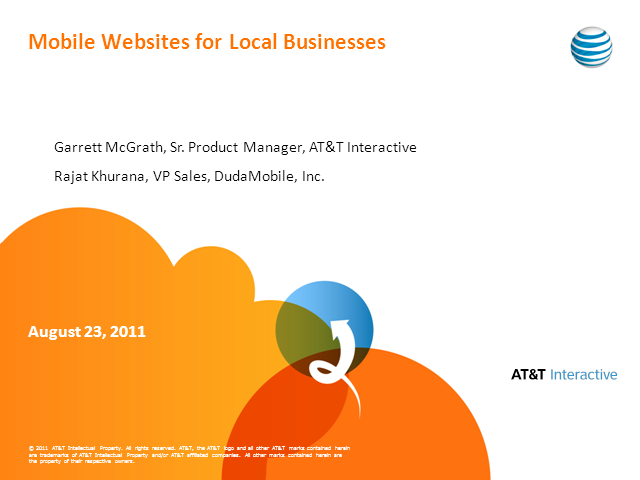 We'll also share data and key learnings from AT&T's extensive mobile website portfolio and feature industry insight covering the mobile website space as a whole. Garrett McGrath, Sr. Product Manager, AT&T Interactive and Rajat Khurana, Vice President, Sales, Duda Mobile, Inc. Presented by: Garrett McGrath, Sr. Product Manager, AT&T Interactive and Rajat Khurana, Vice President, Sales, Duda Mobile, Inc.